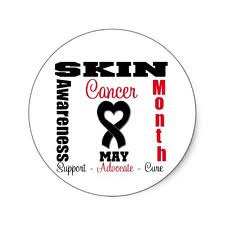 Did you know that May is skin cancer awareness month? My husband heard it on KLOVE the other day and mentioned it to me. I did not know this but was interested because skin cancer runs in my family. I started doing a little research on the topic and learned that malanoma is the deadliest form of cancer. I was surprised at this. This kind of cancer continues to be on the rise as more and more people are being diagnosed. The lifetime risk for men is 1 in 36 and for women is 1 in 55. I found some of these facts on the Skin Cancer Foundation website, which has a lot of information to take a look at. The American Cancer Society also has a lot of good info on this topic. I also found some good tips at prevention through the National Council on skin cancer prevention. 1. Do not intentionally tan or burn. Avoid tanning beds!! 2. Stay in the shade. The sun is the hottest between 10am and 4pm. 3. 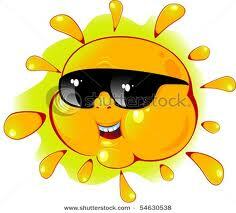 Wear protective clothing such as wide brimmed hats and sunglasses, sleeved shirts and pants. 4. Be generous with sunscreen. Use at least an SPF of 30 and one that has both UVA and UVB protection. Apply 15 min. prior to going out and reapply every 2 hours. 5. Be careful around water, snow and sand as they are more reflective to the sun and you could burn easier. 6. Get your vitamin D safely through diet and vit. D supplements. Since I am fair-skinned and have a history skin cancer in my family, I am careful to protect my skin when I am in the sun. I use a good and safe sunscreen through Shaklee, which is the #1 natural nutrition company in the US. It is wonderful for my entire family, including my small boys. I like it because it isn’t oily and we don’t smell like a coconut after putting it on. lol. 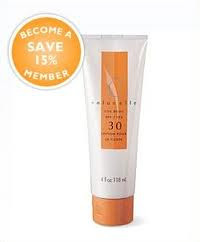 It is SPF 30 and protects against UVA and UVB rays and also helps prevent premature aging of the skin. Like all of Shaklee’s skin care line, it is paraben free. And remember that Shaklee is running a free membership with any product order in the month of May promotion. It’s a great time to try some of these wonderful skin care products and always save at least 15% through your membership. Membership to Shaklee is like joining Costco but without the annual fees. No minimums or required autoship. It’s a great deal, which is why I love sharing it with you! I hope you have a healthy day and I hope this post was a helpful reminder on some things you can do to protect your skin as we head into the hot summer months. This entry was posted in Shaklee, Skin Care. Rebecca Colby is a Christian wife, mom of 2 young boys, health coach, music therapist and business owner. When working as a rehabilitation therapist with people with disabilities, she noticed how diet impacted her clients' behavior. This led to her rediscovering Shaklee, the leading natural nutrition company in the US, and something she grew up with! Rebecca is passionate about sharing health and wellness information with others and to help them to build better health for themselves and their family.